Following rave reviews from our first group in 2017, join us on an activity holiday in the stunning Costa de La Luz. Kayak through marshlands, cycle through woodland and ride a horse along pristine beaches – this has to be the ultimate way to see the natural beauty of this region. Over 7 nights we will be exploring the wonderfully diverse landscape of the Costa de la Luz on foot, kayak, bike and even on horseback! From the Portuguese border to the Straits of Gibraltar the Costa de la Luz this region and is renowned for its flora and fauna. This ‘Coast of Light’ is home to the world-renowned Doñana National Park, recognised as the most important wetlands in Europe and the only region still inhabited by the endangered Iberian Lynx. After a day of activities, we can kick back and enjoy our hotel which is located in Mazagon just a stones through away from a beautiful sandy beach. Today we go cycling! The first part of our 12km journey is through wetland trails before heading into the coastal woodlands which is home to huge variety of wildlife. Later, we take the ferry over to La Fleche de El Rompido a fantastic stretch of beach where we can relax, admire the sand dunes and perhaps even spot a resident chameleon! After exploring Doñana National Park, we can enjoy 2 hours of horse riding along the wild sandy beaches that stretch for miles along the coast, whilst admiring the stunning sandy cliffs of Asperillo. This ride is suitable for beginners and helmets will be provided. 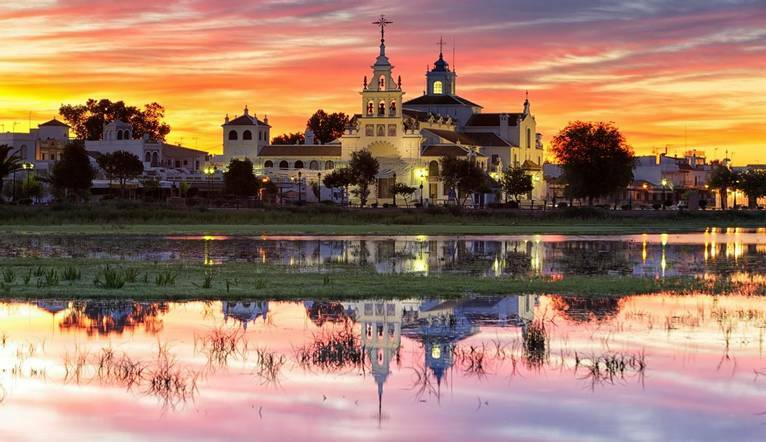 Later, we visit charming El Rocio, a village famous for its annual pilgrimages and residing on the edge of the wetlands, it has a real ‘wild-west’ feel and the sandy streets are designed for horse and cart rather than car! After an introductory birdwatching talk, we take a short walk through a native forest and see what birdlife we can spot. Gliding along the peaceful waters of the marshlands paddling on our kayak adventure we can seek out the native wildlife of the area, if we’re lucky we may spot flamingos or a Montagu’s harrier, both of which call the Isla Cristina Marshlands home. Later we visit a traditional fishing harbour and a traditional salt pan, where we can learn more about the special relationship between the salt pan workers, sea and the sun. We drive to the mountain range of Aracena and spend the morning hiking through the forest (approximately 9-13km), where the black Iberian pigs feed and produce some of the best ham in the world! In the afternoon we marvel at the magnificent Cave of Wonders, an awe-inspiring network of limestone caves before returning to our hotel. Our comfortable hotel is situated in Mazagon, an attractive resort on the Costa de la Luz. The hotel is a short walk away from the town centre, as well as its beautiful sandy beach. Hotel facilities include a bar, restaurant and rooftop sun terrace. Free Wi-Fi is available in the hotel. All the rooms are well equipped with en-suite bathroom, air-conditioning, telephone, hairdryer, satellite TV and safe. You must be fit and able to participate in this holiday, as it involves kayaking, cycling, horse riding and hiking. Walking boots are recommended. The transfer from Seville Airport to our hotel is approximately 1 hour and 30 minutes, dependent on weather and traffic. There may be some opportunities for optional tours available to you. Please note that prices shown may vary according to numbers. Full details will be given at your Information Meeting. All tours must be paid for in euros only. Your Tour Leader will help arrange these for you but may not necessarily accompany you.